DC Velocity rides along with a UPS driver to learn the ropes of today's technology-enabled parcel delivery business. Watching one of UPS Inc.'s big brown vans (or "package cars" in company parlance) on its daily rounds, a casual observer is struck by the driver's relaxed demeanor. The cab doors are wide open, and the driver greets customers with a wave of the hand after navigating narrow driveways with the confidence that comes with doing this thousands of times before. Behind the seemingly casual habits, however, is a long list of rules that dictate nearly every movement a driver makes, from morning calisthenics (stretch those legs) to the proper height for carrying a box (well above the belt) and the correct way to exit the truck (always put down that package before stepping down). Newcomers may chafe at these restrictions, but leaders at the company's Atlanta headquarters hold every employee to the strict standard, from the youngest conveyor belt operator to the 30-year veteran driver. In June, the delivery and logistics giant invited a DC Velocity editor to ride along with a UPS driver on his morning route in one of Boston's Southwest suburbs. We witnessed the nitty-gritty of a driver's day, the challenges he faces, and how technology has influenced every step of the process. Enter UPS's Norwood, Mass., distribution center at 8 a.m. and you quickly realize that you missed a lot of activity while you were downing that first cup of coffee. The day's first tractor-trailers arrived around 2 a.m. and disgorged their stacks of packages onto webs of high-speed conveyors that crisscross the cavernous facility. The boxes fly past labeling stations, where adhesive stickers are applied to each one with a puff of pressurized air. The pre-load function begins at 4 a.m., as workers prepare to begin loading the trucks. The company's proprietary load-planning software generates a three-dimensional floor plan for every truck, showing workers where to stack each parcel. Done correctly, the boxes will be positioned in the exact sequence they'll be delivered in, so the proper item is waiting at arm's length as the driver pulls up to the next stop. About 42,000 parcels move through the Norwood center during this overnight shift on a slow Wednesday in June. But volume can easily reach double that during peak periods, such as the winter holiday season. This particular DC also sees spikes in the summer when suburban homeowners order barbeque grills and patio furniture, and in the fall when students take up residence at the Boston area's many colleges and universities. Even in the off-peak seasons, each driver delivers between 125 and 175 packages on his daily route, so experienced drivers will tell you that pre-load is critical. That's where logistics technology makes its biggest impact on the process. An overnight supervisor uses proprietary software to calculate how many truck routes will be needed to accommodate the day's package count, to balance driver workloads, and to arrange for enough drivers. Big Brown keeps such a close eye on the bottom line that managers see a column on their computer screens that calculates the dollar impact every time they change a route or reassign a package to a different truck. Once the loads are assigned, managers apply the routing software known as ORION. The acronym stands for "On-Road Integrated Optimization and Navigation," but Mark Wallace, UPS's senior vice president for global engineering and sustainability, calls it "MapQuest on steroids." This proprietary application shaves precious minutes off every driver's trip by calculating the shortest possible delivery route, even allowing for changes on the fly. The software is also what enables the carrier to offer enhanced services like flexible delivery times and, for those customers enrolled in its MyChoice program, the option to reroute their packages to a different delivery address or a "smart locker" location. UPS' ORION software calculates the shortest route for each drive and can make changes on the fly. UPS launched ORION in 2013 and plans to deploy it to all 55,000 of its North American routes by the end of 2016. Ideally, the result will be a reduction in driving time, mileage, gas, and emissions. As UPS brass is fond of saying, "The greenest mile is the one you never drive." In practice, some drivers complain that ORION fails to reflect real-time traffic and road conditions, with the result that they sometimes get stuck behind a school bus or funeral procession. UPS technology executives say the next release will address this by allowing real-time updates. Competing parcel carriers may designate different trucks for express service versus two-day delivery, but each UPS truck must accommodate parcels with an array of overlapping delivery deadlines. A single UPS truck might leave its DC at 8:30 a.m., deliver all of its Next Day Air packages by 10:30 a.m., make a second loop of its neighborhood to deliver UPS Ground parcels to businesses by 3 p.m., then make a third loop to deliver residential packages and make pickups. 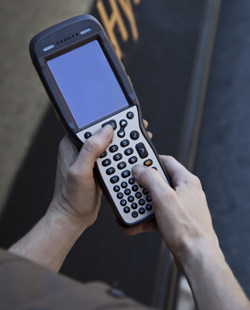 To help sort out those overlapping deadlines, the driver's constant companion is the handheld computer he uses to display a list of addresses, scan every parcel to record the time it's delivered, exchange text messages with a manager, or make arrangements to meet another UPS driver to exchange a mislabeled box. The next iteration of UPS' DIAD handheld will add smartphone-style features such as a color navigation screen and dynamic optimization, UPS says. UPS calls the handheld computer DIAD, for "Delivery Information Acquisition Device." The mobile unit, which is now in its fifth version, was launched in 1990 to help drivers cope with the accelerated pace and complexity of modern-day parcel delivery. The sixth iteration DIAD will add familiar smartphone features like a color navigation screen and dynamic optimization, UPS CIO Juan Perez said at a recent company media day event. Equipped with the latest ORION and DIAD technology and trained in UPS techniques for everything from exiting the truck to deploying the two-wheeled dolly, a driver might seem like just a small cog in a big brown machine. But many UPS drivers stick with the same delivery route for decades, memorizing every street on their route and getting to know their clients by name. In the space of a few hours along Norwood's bustling Route 1, we visited multiple car dealerships, a sporting goods store, a gym, a plumbing supply store, an electronics supplier, a law office, a computer programming school, a pharmaceutical firm, an automotive body shop, and a garage occupied by an elderly man running a mail-order business. A 15-year veteran of the route, the driver greeted most of his customers by their first names and a corny joke, or with some good-natured ribbing about their golf handicap. Our day trip affirmed what many, especially those at UPS, already know: Its drivers are the face of the company. They do more than pick up and deliver packages. They interact, answer questions, and field complaints. They project the brand's image to the outside world. That is why for all of the company's whiz-bang technology and all the talk about autonomous vehicles, UPS will continue to rely on human drivers to manage its routes, and its customers, for years to come. Feedback: What did you think of this article? We'd like to hear from you. DC VELOCITY is committed to accuracy and clarity in the delivery of important and useful logistics and supply chain news and information. If you find anything in DC VELOCITY you feel is inaccurate or warrants further explanation, please ?Subject=Feedback - : Technology keeps UPS drivers on pace">contact Chief Editor David Maloney. All comments are eligible for publication in the letters section of DC VELOCITY magazine. Please include you name and the name of the company or organization your work for.